With his son Robert Stephenson (1803-59) away from June 1824 in South America — struggling to transport mining equipment over narrow mule tracks through the Colombian mountains — George Stephenson devoted his full attention to railway projects. He immediately embarked on a survey for the newly formed company behind the Liverpool & Manchester Railway. This was fraught with danger, as the surveyors faced hostility, blockades and even gunfire from landowners along the proposed route. They also met with implacable opposition from the proprietors of the Mersey & Irwell Navigation, the Bridgewater Canal and the Leeds & Liverpool Canal. Increasing industrialisation in northern England in this period was leading to ever-larger volumes of goods arriving at Liverpool Docks, such as raw cotton bound eastwards for the mills in Manchester. The state of the roads and waterways of the time meant cargo could take longer on its short inland journey than it had by sea. However, canal owners were not going to relinquish lightly their power and income in favour of railways. The Liverpool & Manchester Railway was an ambitious civil engineering project — double tracked throughout its eventual 50km length, and now acknowledged as the world's first inter-city line. The variety and complexity of its engineering structures would be matched by its strategic importance and the public interest it sparked. 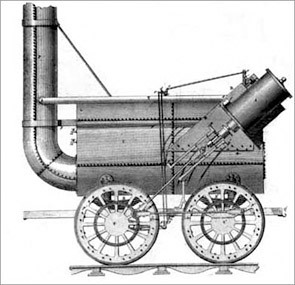 Its proprietors were convinced that some form of steam power was the way forward, having seen trials of Stephenson's locomotives at Killingworth Colliery in January 1825. In February 1825, Stephenson presented a survey report and estimate, and the Parliamentary debate on the railway Bill began the following month. Brutal cross-examination revealed errors in the scheme's costings and in the levels, which had been surveyed by inexperienced assistants. The Bill was rejected, and Stephenson was removed from his post by the railway company. Brothers George Rennie (1791-1866) and John Rennie junior (1794-1874) were appointed instead. This naturally cast doubt on Stephenson's abilities. Nevertheless, he was still very much in demand, and work on the Stockton & Darlington Railway was continuing apace. As contemporary author Christopher McGowan has noted, defeat was not a word in Stephenson's vocabulary. Among the other proposals he worked on in this period were the Birmingham & Derby Junction (survey 1825), the Bolton & Leigh (survey 1825) and the Canterbury & Whitstable (Act of Parliament 1825) railways. He also organised survey work for several trunk lines he considered desirable, such as lines described as the London & Northern and the London & South Wales. A little later came the Leicester & Swannington (Act 1830), Grand Junction (Act 1833), and the Manchester & Leeds (Act 1836) railways. For some of them, he was appointed engineer. On 31st March 1825, the Bolton & Leigh Railway (single track, mostly freight) received royal assent, followed by the Canterbury & Whitstable (single track, passengers and freight) on the 10th June — both with Stephenson as chief engineer. The Stockton & Darlington opened in September, and the locomotive manufactory was also busy. Following Stephenson's dismissal from the Liverpool & Manchester Railway, the Rennie brothers prepared documentation for a new alignment, which received royal assent on 5th May 1826. The success of the Stockton & Darlington had dissipated the shadow over Stephenson's reputation, and he was now re-appointed principal engineer. His annual salary was £800, with the condition that he devote at least nine months a year to the project and take on no new railway work during its construction. He moved the family to a three-storey red brick town house at 34 Upper Parliament Street, Liverpool, but often lodged closer to the work site. In 1827, his salary increased to £1,000. Stephenson further modified the railway's proposed line, introducing inclined planes (gradients) east and west of Rainhill, chiefly to reduce the cost of earthworks. The route featured the steeply sloping Wapping and Crown Street Tunnels, no less than 63 bridges, a deep cutting at Olive Mount, the nine-arch Sankey Viaduct and the heroic swamp crossing at Chat Moss. The single span masonry bridge at Rainhill is thought to be the first skew bridge over a railway. On 17th November 1827, Stephenson's son Robert docked at Liverpool, aboard Pacific, after three years in South America. The gauche youth had become an urbane gentleman. The two men — one aged 46 and the other 24 — met as partners, friends and equals more than as father and son. From January 1828, Robert resumed his leadership of Robert Stephenson & Co.'s Forth Street works in Newcastle, by then in desperate need of his ability to advance the design of steam locomotives. The first stretch of the Bolton & Leigh opened on 1st August 1828, with the Forth Street-built locomotive Lancashire Witch in service. Intended originally for the Liverpool & Manchester Railway, which was still under construction, Lancashire Witch had leaf springs and direct-acting coupled wheels. The Bolton & Leigh was completed in 1830, and carried passengers as well as freight from 13th June 1831. Meanwhile, the question of motive power for the Liverpool & Manchester had yet to be resolved. 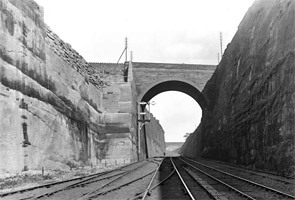 For the tunnels and inclines, Stephenson favoured using stationary steam engines to haul trains on endless ropes, as was common on colliery lines at the time. For the rest of the line he favoured steam locomotives. Opinions on the company's board were divided. They had already ruled out horse power, and some board members, including Joseph Sandars (1774-1857) and Henry Booth (1788-1869), agreed with Stephenson but others wanted to use only stationary engines. To decide whether locomotives were reliable enough, a competition known the Rainhill Trials was set up and run at the Liverpool end of the route. Of the five locomotives that turned up to compete, Cycloped, Novelty, Perseverance, Sans Pareil and Robert Stephenson's Rocket, only four were fit to run. Between 6th and 14th October 1829, they made a series of runs along 3km of track, watched and timed by the judges — textile manufacturer John Kennedy (1769-1855), engineer John Urpeth Rastrick (1780-1856), and colliery manager and railway proponent Nicholas Wood (1795-1865). Rocket, designed and built at the Forth Street works by Robert, who was at this point newly married, emerged as the clear winner. Among Rocket's innovations was a multi-tubular boiler, which was a first. On Saturday 10th October, she sped past the spectators "at the incredible rate of 32 miles in the hour" (51.5kph), breaking all previous records and winning the prize. Just as importantly, she was reliable. The railway company promptly bought Rocket and ordered another four similar locomotives. On 15th September 1830, the Duke of Wellington (1769-1852), then prime minister, inaugurated the Liverpool & Manchester Railway. The line opened to paying passengers on 17th September, and freight services began on 1st December. More than any other, this line marks the beginning of the railway network as we know it today. Most of Stephenson's major works on the line are still in service. The Rainhill Trials made the bluff Northumbrian Stephenson something of a legend. However, the engineering profession was largely not won over. His undoubted abilities and self-taught knowledge of civil engineering were considered no match for professional qualifications. Celebrated wholeheartedly these days, Stephenson's achievements did not at first gain a him a place in the engineering establishment. However, the family must have been jubilant at his success with the Liverpool & Manchester Railway. But the next year started with a tragedy. On 22nd January, Stephenson's 41-year-old younger brother John Stephenson (1789-1831) was "killed by a fall of the shear legs" at the Forth Street works. On 30th April 1831, Stephenson was granted a patent (No. 6111) for Constructing wheels for railway-carriages. In the same year, Stephenson and his son worked on the Leicester & Swannington Railway. Stephenson raised much of the capital for the scheme and Robert was its engineer. The line opened on 17th July 1832, by which time Stephenson had acquired the nearby mansion Alton Grange as his next residence. The Leicester & Swannington ran close to Whitwick Colliery at Snibston (present day Coalville) in Leicestershire, an area both men realised might yield plentiful coal. In partnership with Sandars and Joshua Walmsley (1794-1871), Stephenson purchased the Snibston Estate at auction. Pits were sunk in 1831 and 1833, worked by miners from Northumberland for whom housing, a school and a chapel were provided. The 1833 pit would remain in operation until December 1983. On 6th May 1833, the Grand Junction Railway Act was passed for a line from Birmingham to Newton le Willows, Merseyside. Stephenson and Joseph Locke (1805-60), who had carried out the original survey, shared the duties of engineer. 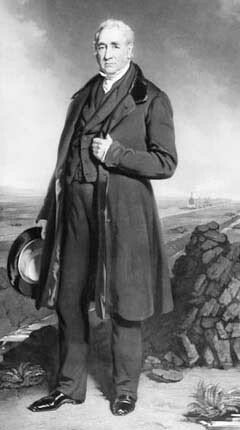 However, the highly organised Locke was appointed the railway's sole engineer in 1834. Stephenson and Robert travelled to Brussels in 1835 as consultants to the Belgian State Railway. Belgium had gained independence from the Netherlands in 1830, and viewed a national rail network as essential to the country's economic integration. The Stephensons advised local engineers on the construction of cross-country routes, set out at their standard gauge, and the Forth Street works constructed two of the three locomotives used at the opening of the line from Brussels to Mechlin (6th May 1835). George was invested as a Knight of the Order of Leopold, an honour that Robert would receive in 1841. Both would later decline British knighthoods, preferring to stay true to their working class origins. George wanted "no flourishes to my name", as he put it. Stephenson also surveyed the line of the Birmingham & Derby Junction Railway. Its Act was passed on 19th May 1836, and he was appointed engineer, though it was Robert who took up the post in the end. On 4th July 1836, royal assent was at last granted for the Manchester & Leeds Railway, a scheme first proposed in January 1825. Stephenson played a supervisory role and Thomas Longridge Gooch (1808-82) was engineer. The 1830s and 40s marked the period often referred to as 'Railway Mania' — and the full force of the mania was about to begin. Although busy, Stephenson was to be even busier, with railway enquiries from around the world crossing his desk. The increasing demand for new rail projects, many of them speculative, would lead father and son to set up a London office in 1836. 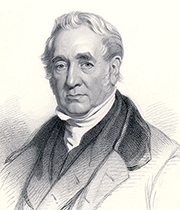 George Stephenson was at the height of his powers. Detail, Portrait of George Stephenson standing on Chat Moss. Lithograph (published 1849), T. L. Atkinson after the painting by John Lucas. A locomotive of the L&MR can be seen crossing Chat Moss in the backgound. 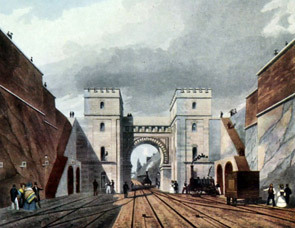 Looking east (from the entrance of the Wapping and Crown Street Tunnels) to Stephenson's original Edge Hill Station and Moorish arch (dem.) on the Liverpool & Manchester Railway (opened 15th September 1830). Steam winding engines were housed in the side rooms in the cutting. Olive Mount Cutting (1830), Liverpool, photographed in 1881 just after widening. 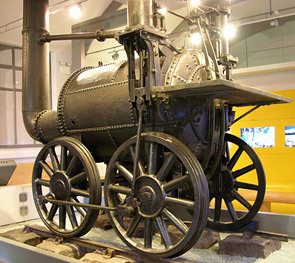 Rocket (1829), designed by Robert Stephenson (1803-59) with input from his father. Winner of the Rainhill Trials and purchased by the L&MR Co. She is now on display in the Science Museum, London. 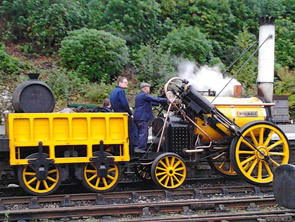 A replica of Rocket under steam, Bodmin & Wenford Steam Railway, Cornwall, October 2014. Sans Pareil (1829) designed by Timothy Hackworth (1786-1850), also competed in the Rainhill Trials, and worked the Bolton & Leigh and the L&MR. Her cylinders were supplied by Robert Stephenson & Co — Hackworth had worked at their locomotive works for a year. Sans Pareil is now in the National Railway Museum, Shildon. Vauxhall Station, Birmingham, terminus of the Grand Junction Railway (1837), engineered by Stephenson and Joseph Locke (1805-60). 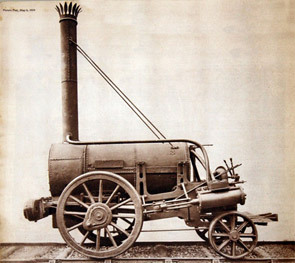 The Stephensons' Lancashire Witch (1828), first used on the Bolton & Leigh Railway. She later worked the L&MR.